This is a startling statistic! But now RMAX has created a solution to this dilemma, a solution which will allow you to prevent injury so that you may enjoy a lifetime of pain free running. But that’s not all. In creating this solution we have also developed a systematic approach that will immediately and without end skyrocket your performance! Whether you run for sport, recreation or fitness, this comprehensive course offers you time-tested and proven techniques, mechanics and performance enhancing exercises that will take your running to the next level and beyond - instantly. You will be able to apply these coveted secrets to ultra and marathon distance running, cross-country, multi-sport adventure racing, bare-foot as well as booted running, high intensity short distance exercise, as well as the daily grace of natural walking. 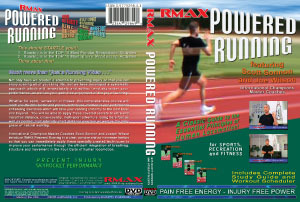 Join Hall of Fame Award-Winning Master Coaches Scott Sonnon and Joseph Wilson, both International Champions in their respective sports, as they introduce RMAX Powered Running. In a clear, concise and no-nonsense fashion, these two world-class coaches teach you how to immediately apply their specially created techniques to improve your performance through the efficient integration of breathing, structure and movement in the Four Gaits of human locomotion: Walking, Trotting, Jogging, and Sprinting.